I need to simplify the power situation. I don’t really need three wall warts, I can daisy chain one of those supplies, I just need the daisy chain. 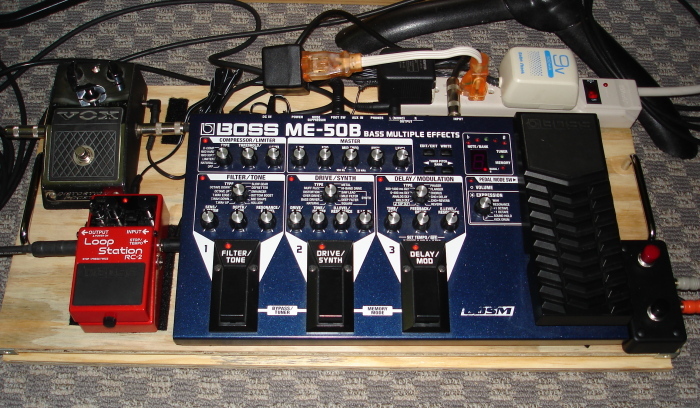 I have the Vox Distortion Booster set at the front of the chain to make a crazy synth sound with the Wah if I want. It’s not the best pedal for that purpose, but it’s what I have. It feeds back a lot since it comes before the Noise Supressor. Oh well. I need to make some right angle cables cut to the right length too, since the standard guitar patch cables I have are far too long.